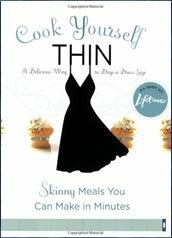 Cook Yourself Thin is a recipe book based on the popular television series of the same name. The creators of the cookbook say that it offers dieters the skills and the confidence they need to give their favorite indulgent meals a healthy makeover by cutting the calories without compromising flavor. The overall philosophy is to change your diet, instead of going on a diet, and to make a few small changes that will produce a lasting difference. Cook Yourself Thin says that their cookbook is a guide to help you stop starving yourself and start loving food because it is possible to indulge and still lose weight. At the beginning of the cookbook there is a quiz that helps you to work out your Eater ID. After answering a series of questions you will be categorized as an…. Each category of dieters is provided with recipe suggestions to help to easily reduce calorie intake by working within their preferences. For example, an On-The-Run Eater who may have a blueberry muffin and a large latte from Starbucks for breakfast, can save 450 calories by swapping it for two slices of whole grain toast with butter and jelly and coffee with a splash of milk. The cookbook also includes some examples of ‘smart calorie swaps’ for the occasions when you don’t have time to calculate your calorie intake. Instead of eating a bag of potato chips, which has 240 calories, you are encouraged to snack on two rice cakes with low-fat soft cheese, which has just 40 calories. The main part of the Cook Yourself Thin Cookbook offers 80 recipes for breakfasts, main meals and desserts including many lower calorie options for popular indulgences such as Eggs Benedict, sandwiches, burgers, pizza, pasta, fries, cookies, and cake. Fruit, vegetables, eggs, shrimp, chicken, turkey, beef, lamb, tuna, anchovies, bacon, cheese, pasta, potatoes, muffins, granola, oatmeal, whole grain bread, sunflower seeds, skim milk, diet soda, herbs and spices. Cook Yourself Thin does not include exercise guidelines. Cook Yourself Thin: Skinny Meals You Can Make in Minutes retails at $19.99. Provides dieters with reduced calorie alternatives for their favorite foods. Recipes are simple and based on common grocery items. Quiz helps dieters increase awareness of their eating behaviors. Includes a quick guide to identify low calorie foods. Gives information about lower calorie choices for alcoholic beverages. Will not appeal to dieters who don’t like cooking. Does not include a diet or meal plan. Does not provide nutritional information for the recipes apart from calorie content. Some of the recipes contain unhealthy ingredients and are relatively high in calories. Encourages the intake of diet soda. Does not vary greatly from many other low-fat cookbooks. Cook Yourself Thin is a recipe book that features reduced calorie alternatives for popular indulgent meals, without compromising on taste, which is common in some other diet cookbooks. Unfortunately some of the recipes in Cook Yourself Thin are relatively high in calories and contain ingredients such as sugar, bacon and cream cheese, which are not conducive to a healthy lifestyle weight loss plan.